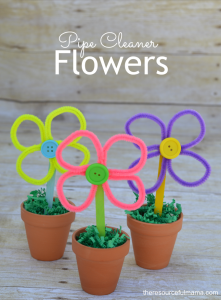 Whether you are looking for a fun and colorful flower craft project or a kid made Mother’s Day gift, you will love this one. It’s sure to brighten up your room and put a smile on mom’s face. My favorite Mother’s Day gits from the kids are items they have made themselves. As much as I love their special kid made gifts, I love the excitement, enthusiasm, and twinkle in their eyes as they present me with the gifts that they have lovingly made. This also makes a great spring and summer craft project. A lot of the items for this craft came from the Dollar Tree: pots, paper shred, pipe cleaners, and popsicle sticks, making it super affordable to make. 1. Paint popsicle sticks and allow to dry. 2. Take the ends of each pipe cleaner and wrap them around it other to form an oval. Take this oval pipe cleaner and twist in the middle so it forms an eight pattern. Repeat this step. Each flower takes two pipe cleaners. Glue the two pipe cleaners together, one on top of the other, where they each cross over to form the eight. 3. Glue a button to the center of each flower. (If you don’t have buttons, pom poms would work as well.) We matched the color of the button to the popsicle stick, but this is not necessary. 4. Glue the popsicle stick to the back of the pipe cleaner flower. 5. Fill the bottom of each pot with newspaper. We glued the bottom of each popsicle stick to the inside of the newspaper filler to help with support. 6. Top the newspaper with green paper shred, so no newspaper is visible. You could also use tissue paper, ribbon, or pieces of small of construction paper.